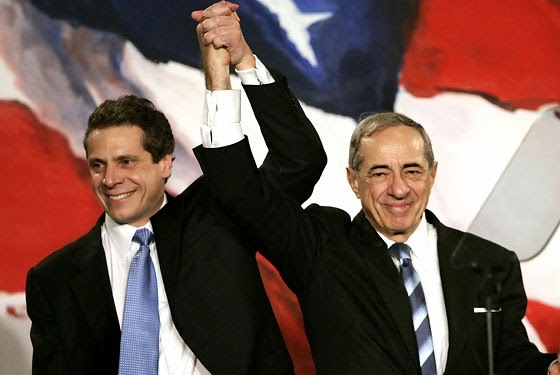 With the passing of Mario Cuomo, we're left to reflect on his legacy. I voted for him every chance I got, and had no reservations whatsoever about it. He's well-known for his principled opposition to the death penalty, which he vetoed every chance he got. It's likely that's what lost him his bid for a fourth term against George Pataki. New Yorkers had also grown weary of his Hamlet on the Hudson routine, in which he endlessly pondered whether or not the time was right to run for President. But there were always reasons to support him. ...there's another city; there's another part to the shining the city; the part where some people can't pay their mortgages, and most young people can't afford one; where students can't afford the education they need, and middle-class parents watch the dreams they hold for their children evaporate. Sounds familiar, doesn't it? This is a theme we heard Bill de Blasio use in his quest to become mayor--it's a theme many lifelong democrats take to heart. This is why a lot of us fight corporate education reform. We want our children and students to have the same or, hopefully, better opportunities that we did. Of course, in that, we have formidable adversaries. Sadly, in the case of Andrew Cuomo, the apple has fallen miles away from the tree. Doubtless it's very difficult to live in the shadow of such a legendary figure, particularly when it's your father. And surely Andrew has gone to great lengths to rebrand himself. That's particularly evident when we look at another section of Mario's 1984 speech. How's that retired teacher in Duluth feeling about Andy right now? The New York Post can't contain its delight at the prospect of placing her on that cat food diet so Murdoch can pull in a few more nickels. It doesn't matter that NY is not in that sort of trouble, and it doesn't matter that the retirement system is not unique to teachers. As for Buffalo, Andy's using it as a rationale to double down on the junk science used to rate teachers. If Buffalo schoolchildren aren't doing well on standardized tests, it must be the fault of teachers. It has nothing to do with rampant poverty or lack of industry. And of course those things are not Andy's problem. While Mario would have fretted over such things, Andy couldn't care less. While Mario Cuomo took a principled stand against the death penalty, son Andrew opts for a principled stand against a millionaire's tax used to fund public schools. The contrast couldn't be clearer. Alas, our governor is an unprincipled, opportunistic, self-serving, morally bankrupt empty suit whose only priority is his own selfish ambition. He does not answer to we, the people, but rather to his wealthy contributors. He brands himself a "student lobbyist," but lobbies only for schools controlled by Eva Moskowitz. We, the UFT and NYSUT, made a huge error in failing to endorse his opponents. Clearly Andy has no appreciation whatsoever for our neutrality. The only redeeming factor here is the fact that he's no longer the juggernaut he was four years ago. It's pretty evident the Emperor has no clothes. Yet when NYSUT and UFT leadership had a choice between Andrew's agenda and Mario's (embodied in the form of one Zephyr Teachout), it chose not only to stand on the sidelines, but also to actively scuttle Teachout's WFP nomination. Perhaps we can credit our activism, as well as Revive NYSUT's questionable promises, for the fact that they sat this one out. But we have to do more. If we respect the legacy of Mario Cuomo, it behooves us all to respect and enable his vision, a vision that respects and empowers not only us, but also our students and their communities.